Let’s Spoil BSE Staff with Cookies! December's Staff Appreciation event is a twist on an old tradition. We are asking generous Bonny Slope parents to bring in two dozen of their favorite winter/holiday treats to share with the staff on Thursday, 12/13. We are encouraging an international theme, so don't be afraid to bring in a cultural or personal favorite from your family's history. Let's get a wide range of treats! 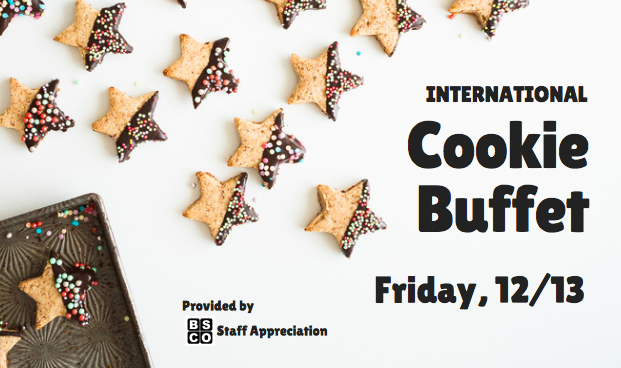 Also this year, we will be setting up these delectables in a magnificent cookie buffet. This will allow our staff members to make their own choices (based on their own tastes and dietary restrictions). Please bring in two dozen treats by 9am on 12/13. Either homemade or store bought is perfectly perfect so do what's easiest! Please note on the sign-up what you will be bringing (if possible). Please include a note card stating the type of cookie and any dietary restrictions (nuts, gluten-free, dairy-free, vegan, etc). Questions? Email Hannah & Jenna (staffappreciation@bonnyslopebsco.org).